Dexter, everyone's favorite serial killer is back as never seen before! 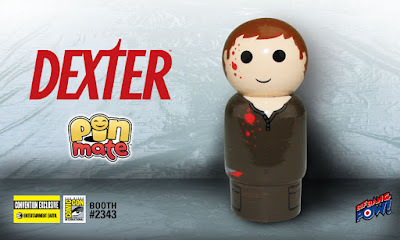 Introducing the Dexter Pin Mate Wooden Figure - Convention Exclusive from Bif Bang Pow! - only at Entertainment Earth. 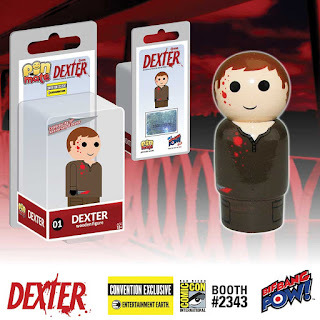 Celebrate the 10-year anniversary (since this award-winning Showtime show first hit the air) with a uniquely numbered, highly collectible Dexter Morgan wooden figure - featured as the first in its series with the number "1" labeled on the bottom of the figure as well as on the packaging. Designed in a retro-style, this Pin Mate™ miniature wooden figure measures a mere 2-inches tall and includes 360-degree, hand-painted artwork that includes some decal elements. Limited to only 1008 pieces, the personalized production of each figure provides a one-of-a-kind authenticity that cannot be duplicated. Plus as an Entertainment Earth Convention Exclusive, each figure is individually numbered as part of a limited production run with a holographic sticker, which makes this already highly collectible piece even more collectible! Ages 18 and up.